If you have always wanted to play the piano but have had a fear of learning, I invite you to try this lesson and see how easy it can be! Many know me as a drum teacher, but not everyone knows that I have also played the piano my whole life…well, ever since I was 5 years old. They tried to teach me to read music back then, but it was too much like (insert scary music) MATH, and I have always been confused by numbers. Also, there was a certain grimness to learning. The horribly mis-named "Music Appreciation" class in a New York elementary school in the 1940's was where music was given a "joy-ectomy." But I loved music, and I loved the piano, and in just a few weeks with a piano teacher I felt I had learned enough to keep myself happily noodling on the keys forever. So I quit lessons. I was almost right. I played all the time on our old upright piano, making things up, trying to play music I heard on the radio. I did pretty well, but there was so much I couldn't do. Then, when I was 14, I took lessons in "Theory in Harmony." After only a few of these lessons I knew enough to take off on my own. And I've been playing by ear ever since. Simone excels at meeting you where you are. She provides a safe environment then helps you bring forth your natural music. Her gift is in helping you connect with a deeply joyful part of yourself. 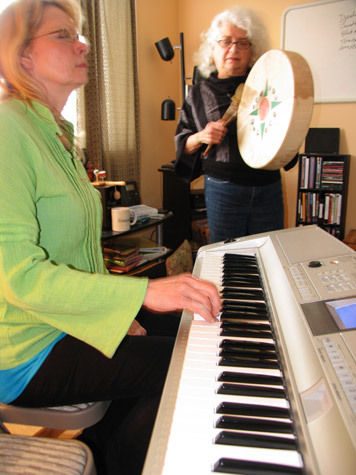 LOCATION: Lessons are one-on-one and are held at my home in the Central District of Seattle. I don't have a piano, but I do have a very good Yamaha keyboard. However, if you have a piano and live in Seattle, I might be able to come to you (depending on distance). REDUCED FEES: If at the end of the first lesson you think you'd like to take more lessons, we can discuss a reduced fee for purchasing 3 or more lessons up front. I want to keep this affordable for you. Piano Meditations is a method of playing ON the piano, which bypasses the conscious mind and channels images and emotions directly through the fingers and onto the keys. Many people have told me that they "used to" play the piano, and that "one day" they want to play again. Many others have told me that they have always wanted to play the piano and that "one day" they plan to finally take lessons. But for many folks there is something intimidating about this huge keyboard, with all its many sounds and permutations. So I have devised Piano Meditations, which is a method of freeing oneself from the restrictions of having to play the "right" note at the "right" time, and of expressing one's creativity directly from one's imagination onto the keyboard. I work with only one person for one hour at a time. It's important that we not be interrupted and that there be no distractions. I have played the piano my whole life (69 years now). Although I learned to read music just a tiny bit when I was a child, I disliked reading the notes and I had a hard time with the math involved in reading the timing. 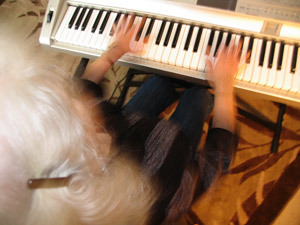 I preferred to just sit at the piano and "noodle" – let my fingers go where they wanted to. Eventually, I learned to play by ear and could pick out almost any song I heard, often with accompanying chords and in an arrangement. I didn't think there was anything unusual about this until only a few years ago, when I discovered that many really good pianists were not able to play by ear. I believe this could be because they had never been given encouragement to leave the safety of the printed page. You can sit at the piano and play even if you've never touched a piano in your life. If, on the other hand, you have played piano before, this is a great way to release the previously undiscovered parts of your musical imagination. There are many different phases of this experience. It's about guided imagery. A lot of it has to do with not looking at the keyboard, and there are several ways this can happen, including simply shutting one's eyes. You will also play "pictures" (no sheet music is used), and create impromptu duets with me based on guided imagery. Learn to Play Piano… BY EAR! and then have the urge to play it on the piano? unless you have the sheet music in front of you? If you have been a “prisoner of the printed page” when it comes to picking out a tune on the piano, help has arrived! I can show you how I manage to play most of the songs I like – in an arrangement – without reading music. And you need to have a good memory of how the song goes in order to pick it out – with corresponding chords – on the keyboard. By demonstrating how I play by ear, I can show you how, for the majority of popular music, you only need to know a few chords. You’ll see how incredibly versatile the chords in that ever-popular piano piece, Heart and Soul, are. You’ll be able to play the blues in the very first lesson. And I will show you some very famous songs that use only 2 chords throughout the entire piece! We can start easy – with simple children’s songs – and work up from there. Lessons are Held at Simone's Central District Studio in Seattle.